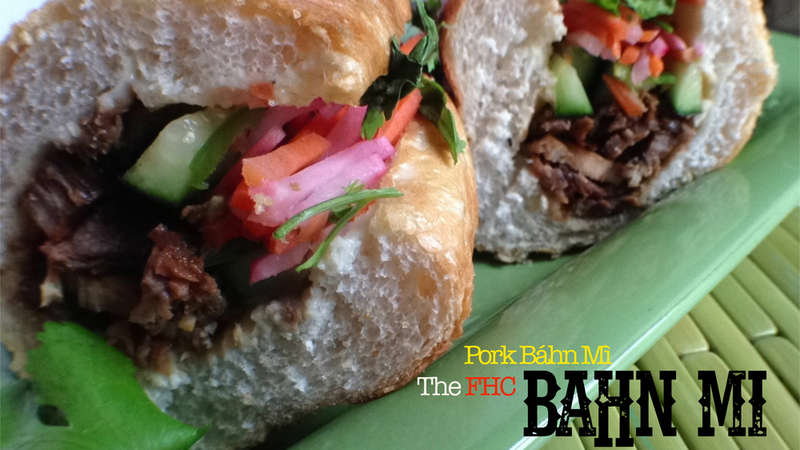 The Báhn Mì, otherwise known loosely as “bread” in Vietnam, is a generic name of a filled bread roll served street side for any of the three major meals of the day (and everything in between). This French-Vietnamese fusion food has taken root here in America, and for good reason. The well-balanced sandwich has a thin-crusted French roll stuffed with grilled pork (or pretty much anything under the sun, literally), spiced mayo, sliced cucumber, pickled carrots and daikon, sliced jalapeno, chopped cilantro… Shall I continue or are you already sold? The combination of well-seasoned protein (or tofu) coupled with fresh vegetables all hugged by heavenly bread is not new too most, (Eat Fresh?) but this particularly delicious combination most likely will be. And what a shame it hasn’t gotten more exposure otherwise this would’ve found a home (and heavy rotation) into firehouses sooner. A few after the fire critiques: I added a teriyaki sauce to the pork, but because of the brine, it will be plenty flavorful for most so feel free to skip the sauce if you so choose. Also, I went with pork, but it’s not uncommon to use traditional pâté, grilled chicken, shrimp, tofu (always thinking of you too Vegans), meatballs in tomato sauce, sardines, fired eggs, etc., it’s all good. I also decided to use radishes in lieu of the fact that most grocery stores where I live don’t carry daikon (or even know what it is and those that do have their stock sit on the shelf so long it becomes flimsy). Lastly, consider topping with a spicy chili paste of your choice. In a skillet over medium heat, add the peppercorn, coriander and crushed red pepper and, toss frequently to avoid burning, toast till aromatic, 3-5 minutes. Place them in a mortar & pestle along with the Serrano chilies, garlic and a pinch of salt. Ground until a paste has been formed. In a large pot or bowl, place the paste and 2 cups of hot water and mix till combine. Add ice cubes and cold water and mix till the cubes have melted and the water is cool. Add the pork (ensuring there is enough brine to cover) and then refrigerate a minimum of 4 hours (or up to over night). Pre-heat the oven to 350°F. Remove the pork, wash over running water then pat dry with paper towels. Spray the baking sheet with cooking spray, place the pork in the middle, season with salt and then roast in the oven for 20 minutes per pound. Remove when the internal temp registers 145°F (we’ll be cooking it again later). Let it rest for 15-20 minutes then thinly slice into bite size strips. In a large deep-sided pan over medium-high heat, add the soy sauce, brown sugar, honey, fish sauce, toasted sesame sauce and water (1 Tbs.) and bring to a low, simmering boil. Reduce by about half and thickened. Add the pork, toss to coat and raise the heat to high. Sear the meat till the sauce has slightly caramelized (3-5 minutes. Remove from heat and reserve. Using either a mandolin or knife, cut the carrots and daikon/radishes into julienned slices. Place the veggies into a colander, aggressively salt (2-3 tbs.) while tossing to coat and allow to sit for 30 minutes. Rinse under running cold water until the salt has been removed. Meanwhile, add the sugar, salt and hot water in a bowl and mix till the crystals dissolve. Add the rice wine vinegar and mix. Place the veggies in and ensure it covers. Allow it to cool then refrigerate and reserve. Place the mayo, fish sauce and lemon juice into a small bowl and mix till combined. Refrigerate and reserve. Slice the rolls lengthwise, apply a lathering of the aioli, and layer the pork, cucumber, pickled veggies, jalapeño and cilantro. Place on the baking sheet and toss in the still warm oven and toast for 2 minutes until warmed. Serve immediately. DONE.